Tough choices, Sam and Mayuko at the same time! Pleased and flipped to have you both here, @Jeff and @NGH. Happy holiday! Oh, man...me and Mayuko are not meant to compete!! I recommend listening to both shows at once, @NGH. It's kind of a Wizard of Oz Dark Side of the Moon thing, Mayuko and I have cooked up this week. It wouldn't be the fist time I've listened to both streams at the same time. Just jumped from Mayuko's show to here. Might be the first time I jumped! May go back and forth or play both at once. // The photo may be an old one as the holes appear to have had the detachable openers that were discarded, not the ones that now stay attached. Hiya, @TDK! Please do jump back and forth. The archives will always be there to fill in the gaps. 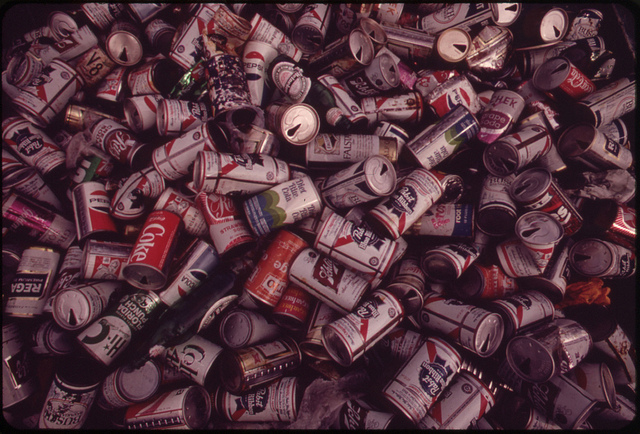 @Dave: Original caption on that photo is: "Dimensions of the Littering Problem Are Suggested by This Heap of Cold Drink Cans, Salvaged by Girl Scouts at Islamorada in the Central Florida Keys"
I'll remain seated here while Rahsaan R.K. plays. @Jeff: You, me, and Doug have all played that tune, it appears. Great minds, etc! Whenever I check who played a certain tune before, 99% of the time it's Doug. Divided by 1000 = seven billion. I have one Golia record, which I adore. It is not this one. Will have to check it out.